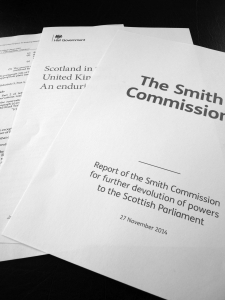 The Smith Commission was established to convert the ‘vows’ made by Cameron, Clegg and Miliband to sway the Scottish referendum result – from a narrow ‘No’ to independence to a wider and decisive ‘No’. In sum the result of Smith Commission is de facto independence but with the rest of the UK bankrolling it. Smith Commission accepts the premise of the SNP Prospectus – that Scotland is a wealthy country and could have been viable independently – and rewards the SNP with most of the benefits of a ‘Yes’ but with far fewer risks, and this for a party that consistently broke the Edinburgh Agreement – before and after the referendum – and invented the risk to the Scottish NHS which was the trigger firstly for their resurgence in opinion polls and secondly for Cameron, Clegg and Miliband to make the ‘vows’. The Smith Commission has thereby bought off on the SNP’s bluff – in its Prospectus, during the campaign and since – and created a deadly threat to the UK’s future, a future that 55% of Scottish voters stated should consist of a Union. This is an affront to democracy.